1. At the beginning of October 2018, the Earl of Sandwich restaurant located in Downtown Disney in Anaheim, California reopened to the delight of the location’s many loyal customers, who were upset when the store closed in June. 2. The Downtown Disney Earl of Sandwich closed when it lost its lease as part of a Disney plan to build a new upscale hotel on the site, which is adjacent to both Disneyland and Disney California Adventure theme parks. Construction was supposed to begin in July, but the hotel plans were put on hold indefinitely after the city of Anaheim and Disney could not reach an agreement over a tax rebate plan. 3. Several other businesses in the area also closed, but the Earl of Sandwich was the only one to reopen. According to a news report, the Earl of Sandwich location was so popular because it was one of the only affordable restaurants in the area. 4. Jim Stanley, president and CEO of Earl of Sandwich, oversaw the grand reopening of the location and said it was because of a “groundswell of support” from loyal customers and Disneyland cast members that the Anaheim branch reopened. Stanley said that the company had been talking to Disney about possibly opening up a pop-up restaurant on the site and perhaps later opening in the new hotel when they got a call asking if they’d be interested in reopening their former store in the same location. Luckily, he said, the only fixtures that had been removed were the picnic tables on the patio, with everything else still intact. 5. The Anaheim store was historically the second-highest-grossing in the chain, after the flagship store at Disney Springs at Walt Disney World. The location served an average of 1,500-2,000 people per day, up to 3,000 on the busiest days. Stanley estimated that some 65 percent of the Anaheim location’s new staff members were actually returnees from the previous run. 7. For years, Earl of Sandwich has offered its Holiday Turkey Sandwich, which comes out annually at the start of the holiday season. The Holiday Turkey Sandwich features warm house-made bread, sliced turkey, cranberry sauce, cornbread stuffing, turkey gravy, and mayonnaise. 8. For the 2018 holiday season, Earl of Sandwich debuted the Holiday Ham Sandwich. The new Holiday Sandwich features some of the same elements of the Holiday Turkey, but swaps out the cornbread stuffing for melted cheddar cheese. The Holiday Ham Sandwich does have cranberry sauce, but features pureed yams instead of turkey gravy and mayo. 9. To round out its holiday offerings, Earl of Sandwich also had a Peppermint Brownie for a limited time. The festive dessert features a soft gooey brownie topped with a sprinkling of peppermint candy on top. 10. Earl of Sandwich was founded in 2004 by Lord John Montagu, the 11th Earl of Sandwich and his son, the Honorable Orlando Montagu, direct descendants of the 4th Earl of Sandwich, who is credited with inventing the sandwich. The Montagus partnered with Robert Earl, the founder and CEO of Planet Hollywood, to open the first Earl of Sandwich restaurant in Downtown Disney (now Disney Springs) on the property of the Walt Disney World Resort outside of Orlando, Florida. 11. 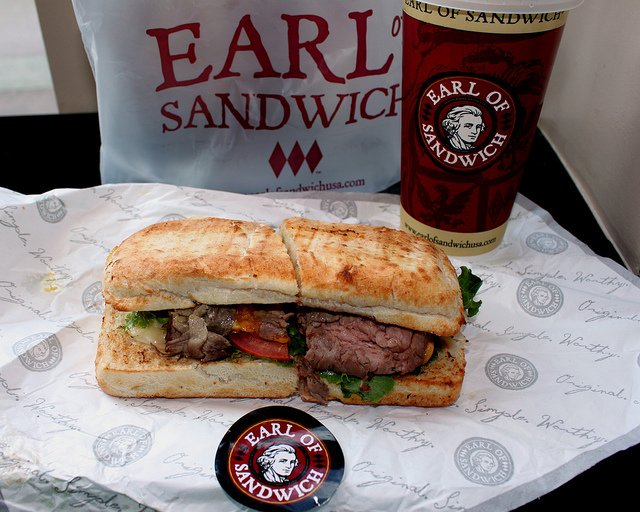 Earl of Sandwich began franchising in 2005. The first franchised location opened in Sugar Land, Texas and is owned by an investment group which includes Nolan Ryan and Roger Clemens (both former professional baseball players). 12. After opening a few more locations in the United States, Earl of Sandwich opened its first international location in London, England in 2011. This location has since closed, but additional UK locations are planned for the future. According to Earl of Sandwich, the company has plans to continue expanding across the United States, the United Kingdom, and other parts of Europe. 13. Earl of Sandwich did not rank on Entrepreneur’s 2019 Franchise 500 list. Please click here for detailed estimates of Earl of Sandwich franchise costs, based on Item 7 of the company’s 2018 FDD. Please click here for detailed information on Earl of Sandwich’s initial franchise fee, royalty fee, marketing fee, and other fees, based on Items 5 and 6 of the company’s 2018 FDD. The Statement of Average Gross Sales consists of the average annual Gross Sales of 16 franchised Non-Traditional Restaurants that were open during the entire 2017 calendar year. The Statement of Average Gross Sales excludes the results from: (a) two Franchised Restaurants that are not operated within a Non-Traditional Location; and (b) two Franchised Restaurants that were not open during the entire 2017 calendar year, one of which is operated within a Non-Traditional Location and one of which is not operated within a Non-Traditional Location; and one franchised Non-Traditional Restaurant that offers full table service. The Gross Sales of Franchised Restaurants were derived from unaudited financial reports submitted by franchisees for the purpose of computing royalty fees. Some Earl of Sandwich Restaurants have sold this much. Your individual results may differ. There is no assurance that you’ll sell as much. The franchisor has not included the costs of sales, operating costs, or other costs and expenses for Earl of Sandwich Restaurants. Therefore, this financial performance representation does not reflect the costs of sales, operating expenses, or other costs and expenses that must be deducted from the Gross Sales figures to obtain your net income or profit. You should conduct an independent investigation of the costs and expenses you will incur in operating an Earl of Sandwich. The franchisor recommends that you make your own independent investigation of the costs and expenses you will incur in operating an Earl of Sandwich to determine whether or not an Earl of Sandwich operated by you may be profitable. Franchisees or former franchisees listed in the Franchise Disclosure Document may be one source of this information. You should consult with an attorney and other advisors before signing the Franchise Agreement.